Trendy Mannequin. 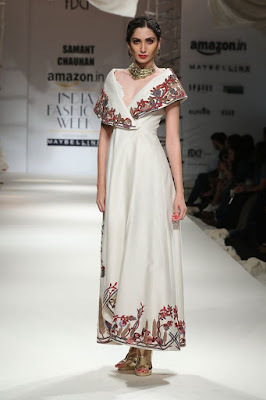 : Amazon India Fashion Week SS16 | Samant Chauhan. As soon as I was let in for Samant Chauhan's show, all I could think of was sea and ships. The setup of sea ladders and sea cloth made from muslin, literally spoke to the crowd. Inspired from the era of Alexander and the impact of Alexander's marital ties with Kinnauron, Samant Chauhan's collection was simply surreal. As this wasn't my first Samant Chauhan show, my expectations from the designer were pretty high. The designer's collection consisted of 35 outfits, mainly in two colors- white and red. 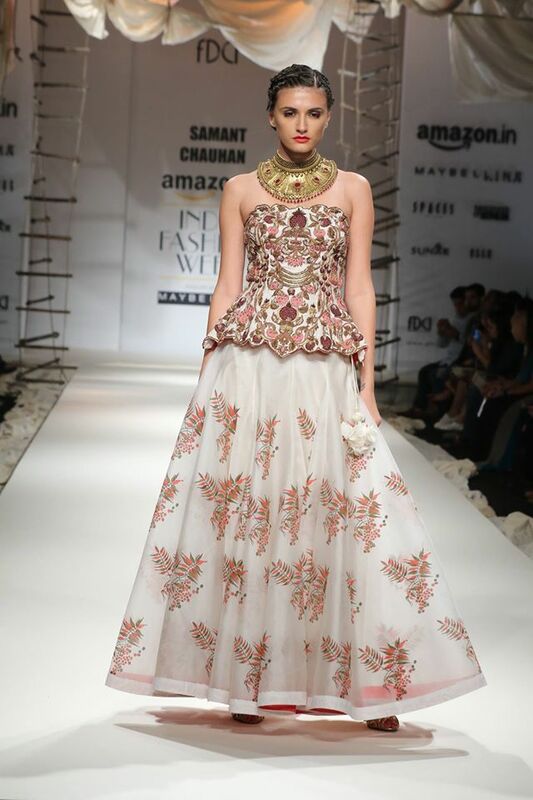 With a melodious tune being played in the background, first came a high and low cotton silk kaftaan and then came the corset and the organza skirt. I loved the corset because it was completely adorned with embroidery and silk thread. The cotton silk gowns gave a very regal look. They were tight fitted till the waist and then flowy. 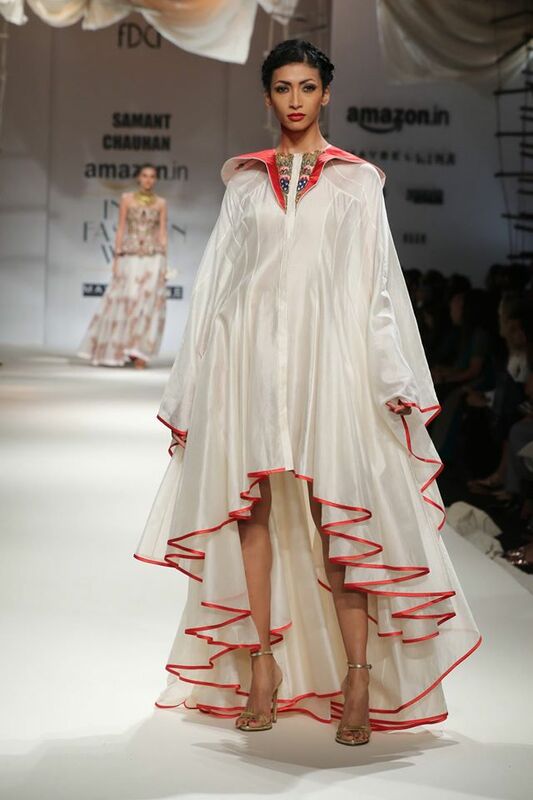 The best part of Samant Chauhan's work was that in all of the flares, the outside was of white and the inside was of red. His work on the details was so fine that one could not help but get awestruck. My favorite of all the gowns was the one with the cape. It wasn't flowy, rather it was straight. But the work of zari and silk embroidery was just apt. Not too much. Not too less. My favorite outfit of the whole 35 pieces was a cotton silk jumpsuit with a silk jacket. The body fit jumpsuit had embroidery work from the neck to the waist area. 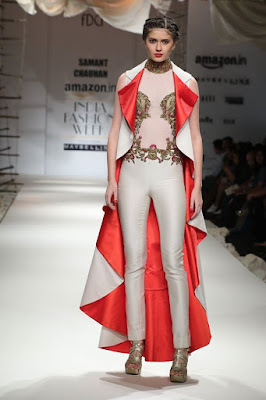 As the jumpsuit was in the shade of white and the embroidery in a complimentary color, the jacket which was in the shade of red really made the whole outfit quite appealing. 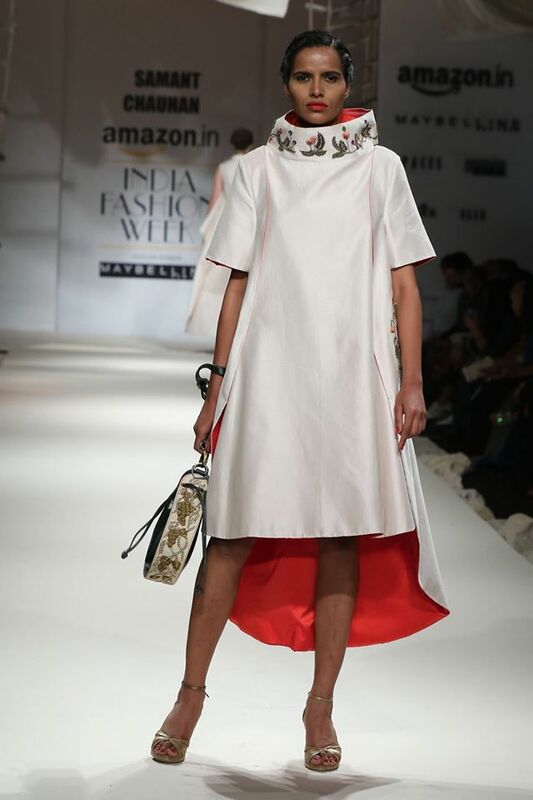 Samant Chauhan and his team- Prashant Chauhan, Sonal, Deepak, Anisha, Nupur and Thahir presented an immaculate show. The bloggers sitting next to me adored his collection too! 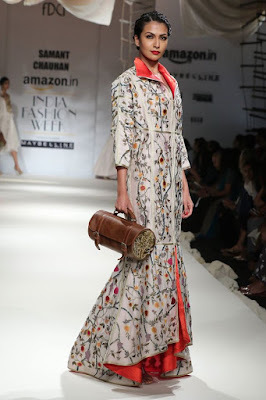 Not to forget, the bags which were carried by models was given much love. 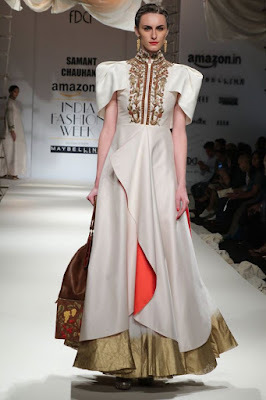 P.S- All the pictures are provided by The Fashion Design Council of India.